Mrs. Lewis will visit each elementary school twice a week, and teach students in first and second grade classrooms for 15 minutes at a time. To learn more about when she will be at your school, visit her classroom website using the link below. Email Señora Lewis if you are interested in helping with our program in any way. Also, if you speak Spanish and are willing to read to the students we would love to hear from you! 2018-2019 marks the first tier launch of the elementary World Language Program. This year, the program will include first and second grade students at all four elementary schools. The program will continue to grow in subsequent years, ultimately creating an articulated world language program spanning grades one through twelve. Learning a language at an early age helps students become effective communicators, and allows students to understand culture at a deeper level. 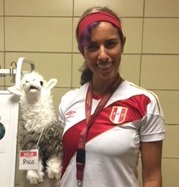 Mrs. Marisa Lewis, an artist and an educator, will bring her Peruvian heritage and native language into every classroom as she introduces Spanish through art, songs, games and engaging learning activities that connect to the themes included in each grade level curriculum. Mrs. Lewis will visit each elementary school twice a week, and teach students in first and second grade classrooms for 15 minutes at a time. Students will become familiar with greetings, numbers, seasons, weather, clothing, and a variety of question and answer techniques throughout the school year.